WHAT IS THE SECRET TO BUILDING HIGH PERFORMANCE LEADERSHIP TEAMS? Increasingly people in all types of industries must learn to work across geographic and cultural borders to form teams that can effectively achieve critical organizational results. However, here is a warning: If the team you are working with is a Leadership Team, comprised of “leaders of leaders”, those same great results are still achievable – but they won’t come easily. Our experience tells us that the most difficult teams to work with have team members who hold leadership roles and who are not naturally skilled at building collaborative team-oriented relationships with their peers. A group of two or more people who lead organizations that represent diverse functions, geographies or areas of expertise and who are committed to collaboratively serve some significant organizational purpose for which they hold themselves mutually accountable. By definition, these leaders hold such positions as Senior VP, Department or Division Head, Business Unit leader, Brand Leader, Executive Committee Member, etc. They are leaders of their own functional and/or geographic organizations who have been asked to work together to provide value beyond what they and their organizations respectively provide. A Leadership Team differs from what we call a “working group” whose members happen to directly report to a particular leader and who have responsibility for specific functions, geographic markets, product lines, departments, etc. They interact primarily to share information and perspectives; also, there are no shared performance goals, joint work products or mutual accountability. 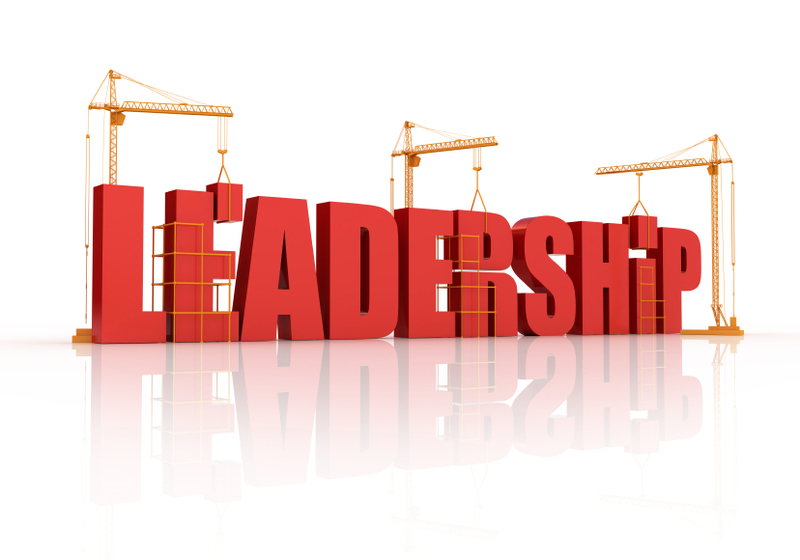 What are the Challenges Facing Leadership Teams? In collaborative team relationships, team members recognize that each individual brings valuable assets, knowledge and skills to the team. They know that what they can achieve together is more than they could achieve on their own. They interact openly, are willing to exchange information, collectively examine issues and work through any conflicts that arise. They trust each other, focus on the greater good of the team and the organization rather than focusing on individual agendas, making unilateral decisions, or pulling power plays. However, Leadership Teams are comprised of leaders who have often made it into their positions because of their ability to master individualistic and competitive behaviors. Most are better able to see themselves as a team with their direct reports than with their peers. It is not uncommon for a “leader of leaders” to choose not to manage his or her direct reports as a team, preferring to just use staff meetings as fyi forums and to periodically just pull some of them together to discuss common issues. As one Division leader said to me one day “it’s like herding cats – to get them to reach out of their own silos and collaborate with each other”. My reply to him was “that’s because they’re not just cats – they’re lions – Kings and Queens of their own jungles”. Our research and consulting with Leadership Teams suggests that whether a group of leaders function together as a team or operate as a siloed working group begins with the decision of the “leader of leaders” as to what beliefs he/she holds (i.e. do I need a team?) and his/her willingness to discipline the team to follow the processes required to effectively function as a real team. I have worked with Leadership Teams in more than 35 countries and have observed them dealing with the inevitable tension between managing their need to independently lead their own organizations and work with their peers on strategic initiatives that will benefit the larger enterprise. However, once these peer leaders come to see the value in their working together, the impact on organizational results and their ability to serve as collaborative role models is extremely powerful. When did the term “conflict” get such a bad name? In my work with teams over the last 25 years all around the world, I have never found a high performing team that did not have moments when team members disagreed, debated, or argued. These teams all had a healthy respect for the value of not only having differences of opinions or perspectives, but for having learned how to manage themselves as they worked through the discord or tensions precipitated by their disputes. Rather than being an enemy of collaboration, conflict is a necessary requirement for productive and successful collaboration. In group or team settings managing conflict effectively requires creating a climate where people feel comfortable to openly and honestly discuss issues. To create the right climate it is essential to establish trust. If trust is low, people hold back and fail to discuss issues openly. This cuts down on the team’s ability to solve problems. While trust is essential it cannot be mandated; it must be earned. When team members believe they can share openly without fear of reprisal, they will be more willing to address conflicts. People who work together as a high performing trusting team learn to give others the benefit of the doubt when conflicts arise. Leaders can foster this by making sure they keep all team members in the “information loop.” And they can seek all team members’ inputs when developing approaches for resolving issues. When people feel others are working for the benefit of the team more than for their own personal interests, they will be more willing to first find out what is happening before getting angry and shutting down communications. Once the right climate is established team members need to use constructive communication techniques to keep their conflict conversations moving in a way to facilitate collaboration. In conflict situations generally people talk less. When conflict arises and communication has slowed down, effective leaders make sure to reach out to encourage people to start talking again. 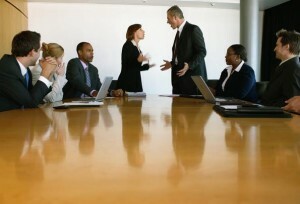 Conflict communication consists of talking and listening. Two behaviors typify good listening. The first is perspective taking which involves trying to see things from the other person’s point of view. By trying to do this, you can learn new things about a conflict that may prove helpful in resolving it. The second technique is called listening for understanding. This involves hearing what the other person has to say whether you agree with it or not. Most of us listen to respond; we hear the other person’s words but at the same time we judge whether they are right or wrong so we can correct the other person. This type of listening causes us to miss many important points and does not foster good relationships.. When you listen carefully the other person will usually calm down and you will pick up ideas that can help resolve the conflict . When you have listened carefully the other person becomes more open to listening to you which can make it easier to make your own points. Once this mutual sharing has occurred you are well positioned to be able to explore new options for creating solutions to the problem you jointly face. This search for options can lead to solutions that meet all parties’ needs. Conflict is a natural part of life. People recognize this but are often afraid to address it. When that happens collaboration is hampered because communications wither. 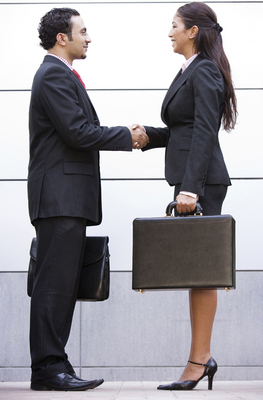 By managing conflict effectively, collaboration can be enhanced and its promise fulfilled. For further information about Lynda McDermott’s work with teams and team leadership contact Lynda McDermott at lmcdermott@equiproint.com. It’s graduation time again and thousands of high school and college seniors are ending one journey of their lives and beginning another. I had the privilege several years ago of delivering a commencement speech to the graduating seniors of my alma mater, Miami University (Ohio). It was so well received that I turned it into an eBook “Leadership Lessons for Graduates”. I believe it is never too soon (or too late!) to remind young people about their responsibility to “lead your life, don’t just live it”. Making a speech to upcoming college graduates – is humbling. Sitting at my own graduation at Miami University I never dreamed that one day I would have the opportunity to reflect on my own leadership lessons and impart some of that wisdom to young adults who were getting ready to leave one world and journey into another. I’ve spoken with business leaders in over 35 countries around the world, but without a doubt I considered this the most important speech I’d yet to make. I wanted to say something about the subject of Leadership that would be helpful and practical, and make a real difference in their lives. We need to encourage young adults (and maybe some older ones, too!) to recognize that they have the power to create their own leadership legacies, beginning today. If you would like to receive a copy of this e-book, please contact Jeanine Conway at Jconway@equiproint.com. And please pass this on to others who you believe could benefit from reflecting on some leadership lessons and let us know what you think! So we’re just entering the holiday season with Thanksgiving coming soon. As I reflect on this last year, I want to GIVE THANKS to those who have been part of my community over the years as family, friends, clients and colleagues! My give back to you is a recipe for Nantucket Morning Glory Muffins. For those of you who know me well, the picture of me in a kitchen with an apron on probably does not compute! However, over the holiday season I transform myself into a kitchen cook (notice I do not call myself a chef), beginning with baking these muffins on Thanksgiving morning and progressing on to making German Christmas cookies for family and friends. We have been going to Nantucket for the last 30 years and the Morning Glory Café was one of our favorite spots at the Nantucket Boat Basin. We LOVED their muffins and were so disappointed when they closed their doors several years ago. But a few years back someone printed the recipe for these delicious muffins in the local newspaper and I was ecstatic! Now, be pre-warned-the recipe ingredients are healthy-but added all together I would not like the New York City food police to rate the caloric value of each muffin! So I hope you have a chance to make and enjoy these muffins, which are part of our Thanksgiving tradition. 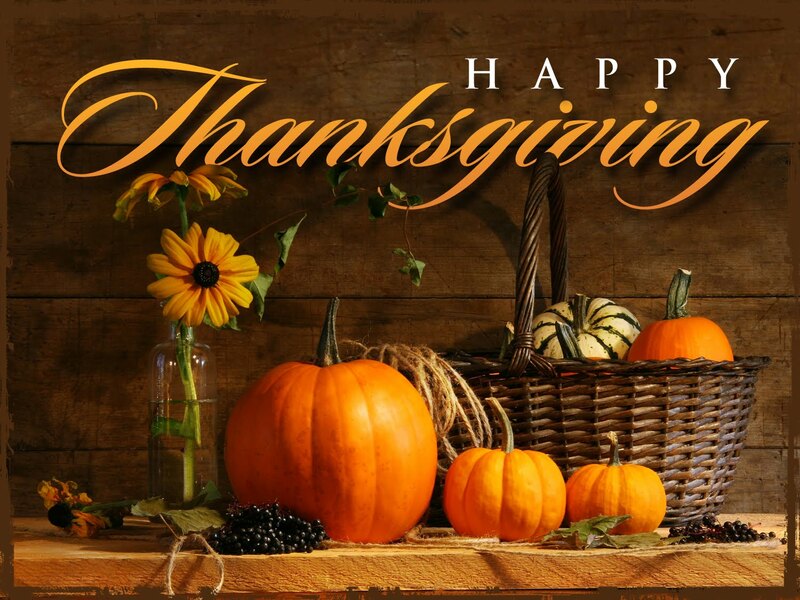 And more importantly, that you spend this holiday reflecting on all that you have to be thankful for! Preheat oven to 350 F. Grease a 12 cup muffin tin or line the cups with foil baking cups. (my preference). Sift together the flour, cinnamon, baking soda, and salt into a large bowl. Stir in the sugar. Add the coconut, raisins, carrots, apple, pineapple, and chopped nuts. Mix well. In a separate bowl whisk the eggs with the vegetable oil and vanilla, then pour into the bowl with the other ingredients. Stir well. Fill each muffin cup to the brim. Bake for 35 minutes or until a toothpick inserted in the center of the muffin comes out clean. Cool the muffins in the pan for 10 minutes and turn out onto a rack to finish cooling. Eat immediately-or better yet, wait 24 hours! DOES YOUR TEAM HAVE AN ENTREPRENEURIAL MIND-SET? Over the last several years there has been an increasing interest in what it takes to become a successful entrepreneur. From Mark Zuckerberg of Facebook to Sara Blakely of Spanx we admire their achievements and want to learn more about what contributes to their incredible success. This interest in entrepreneurship comes from the acknowledgement that entrepreneurs create new innovative products and services, increase economic growth and produces jobs. 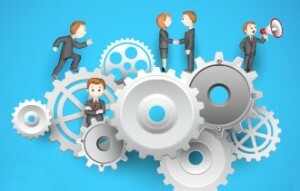 Whether the focus is on solo entrepreneurs, high growth start-ups or large corporations entreating their staffs to be more entrepreneurial, there is a strong belief that having an entrepreneurial mind-set or fostering an entrepreneurial corporate culture is a crucial factor for innovation and economic growth. Their conclusion is that companies that saw themselves as ‘entrepreneurial’, i.e. creative, unique, innovative and willing to take risks, outperformed their peer organizations in growth, productivity and profitability. While there are scores of definitions of what an entrepreneur “looks like” there has been very little research on how to objectively define and develop the core competencies of entrepreneurism. However, after three years of research and development, Eckerd College’s Leadership Development Institute has released a new assessment instrument, under the direction of Dr. Jennifer Hall, called the Entrepreneurial Dimensions Profile™. Based on interviews with hundreds of entrepreneurs and corporate managers, they have researched the traits, motivations and skills of today’s entrepreneurs, regardless of organization size or stage of growth. These characteristics fall within two broad domains: a) personality characteristics and motivations that have been found to distinguish entrepreneurs from non-entrepreneurs and b) cognitive and behavioral skills critical to entrepreneurial success. While some of these aspects are probably ‘hard-wired’ (risk tolerance, independent thinking, and low need for structure) others lend themselves to skill development (idea generation, future orientation and persistence). The EDP assessment allows individuals and teams not only to assess their entrepreneurial approach – but to individually and collectively prioritize how to bridge the gap between their current approach and what their markets and competitive conditions are demanding of them in the future. From this assessment an individual, team or company can develop Action Plans for developing a customized entrepreneurial approach. Our EquiPro clients range from individual entrepreneurs, who are growing small and medium size organizations, and large corporations and professional services firms who want to increase the entrepreneurial capacity of their team members. The EDP assessment allows a benchmarking of their own or their team’s entrepreneurial capacity and is a cost-effective process for assessing entrepreneurial strengths and opportunities for accelerating innovation, creativity and growth. For example, one of our clients is a successful female entrepreneur who is a member of the Women President’s Organization, which is a peer advisory group for women who run multi-million dollar businesses. During the recent recession her revenues had declined because her multi-national clients were cutting back on using the consulting services she provides. We asked her to take the EDP to help us in our assessment of her business. When we reviewed her profile, we discovered that her scores on four of the scales, were significantly lower than entrepreneurs in the database: Nonconformity (a preference for acting and being perceived as unique); Risk Acceptance (a willingness to pursue an idea or a desired goal even when the probability of succeeding is low); Future Focus (a tendency to think beyond the immediate situation and plan for the future) and Idea Generation (a tendency to generate multiple and novel ideas, and find multiple approaches for achieving goals). As we discussed her results she came to realize that her tendency to focus on short-term execution and to rely on her optimistic persistence, while clearly her entrepreneurial strengths, had kept her from looking at her business strategically and creatively. We began our coaching process with her by helping her to think about new markets she could pursue and explore new and unique service offerings that could set her apart from her competition. If you, your team or your company is struggling with the challenges of innovation and growth and believe that a stronger ‘entrepreneurial mind-set’ would improve your results, consider using the Entrepreneurial Dimensions Profile ™ to help you map out a set of Action Strategies for improved success. 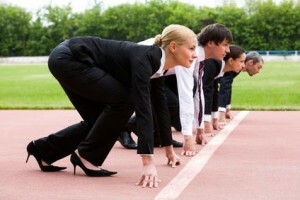 Tough Times Leadership: Are You Ready to “Stay in the Game”? I remember starting my freshman year in college at an out-of-state school, feeling ambitious, excited and ready to take on the world. It wasn’t long, however, before all I could report home was how miserable I felt. Although I’d made the cheerleading squad and was getting good grades, everything surrounding me differed drastically from my earlier life experiences in Ohio. I just didn’t feel like I was “fitting in” and my usual “success strategies” didn’t seem to be working. My confidence was shaken. Then I received a letter from my Dad (a first!) with a very important message: No matter what you’ve done or achieved before, the challenge you need to meet now is to “stay in the game”. My Dad was right. Staying in the game is exactly what’s required when tough times hit like they’ve hit so many of us over the last several years. No matter where you look there doesn’t seem to be much good news. Tough times, whatever their causes, means the pressure is on and the stakes are high. And while emotionally we may want to run for cover, staying in the game is crucial. So what does it mean to practice “stay in the game” leadership? Let me quickly point out what it doesn’t mean: Keep doing exactly what you did in the past and expect the same results! Realistically assess the forces (economic, competitive, political, social, etc.) that are impacting your current reality and the foreseeable future. Denial is not an option. Avoid blaming. There are certainly a lot of places to point fingers for your troubles: the general economy, customers, banks, etc. But nothing is more demoralizing than when organizational leaders don’t look in the mirror and take responsibility for their role in their company’s performance. Re-examine and re-connect to your core values. At times of great duress and turbulence, your core values are your mooring. They ground you in the principles that have guided your success in the past and will enable you to weather the storm. For example, if your core value is “The customer is No. 1” then, despite rising costs and lower margins, continue to make sure you are providing customer value. Forget business as usual. Use the situation to look for new opportunities for changing your business model or game plan. What we know for sure is that when the crisis is over you’ll be left with a “new normal”, so begin to create what that might look like and develop aggressive strategies for getting there. During tough times the best leaders know that more than anything we must overcome an inevitable “crisis of confidence”. Stay engaged and accessible. One of the best examples I recall of leadership team solidarity in a time of crisis was NYC Mayor Rudy Giuliani appearing every few hours on television for days following the 9/11 attack, always flanked by members of his administration. Communicate, Communicate, Communicate. Leaders are the primary caretakers of a powerful commodity…information. Opting to conceal important facts or deliver mostly sugar-coated messages won’t work. Denying reality won’t change reality. Keeping people in the loop is a significant way for you to inspire trust, loyalty and commitment throughout the organization. And don’t forget to find and celebrate with others the signs of positive progress. Leaders in tough times are expected to stay in the game. They are looked to for guidance, inspiration and a clear course of action. In turn, they must look to others for feedback, diverse viewpoints and fresh ideas…and then they must listen. At their best, effective leaders serve as a unifying force, drawing an organization together and keeping it together, bringing people through the worst of times to emerge stronger than before. How Do You Master the Art of Self-Promotion? Do you wish you knew how to communicate your successes without sounding like you are bragging? Women are notoriously guilty of not knowing how to toot their own horns and are not comfortable or skillful in the art of “self-promotion.” I have been working as a consultant, coach and speaker for many years all over the world and one of the workshops that women professionals and executives have been requesting frequently is: The Courage to Sell Your Difference: Mastering the Art of Self-Promotion. What I know from my experience is that this is a critical leadership skill that women MUST develop if they are going to get the career opportunities they covet. What is “self-promotion?” It is the art of taking the lead to let others know about what you have accomplished and what contributions you believe you could make in the future. It is a set of strategies and communications that enable you to differentiate the value you offer to any stakeholder you are trying to “sell yourself” to. The bad news for women about mastering this competency is that most women have a real resistance to the idea that they need to “sell themselves.” They want their successes to be “obvious”; they view others who “oversell” themselves as grandstanding; and it just seems “beneath them” to have to engage in marketing themselves. The First Step: Identify what you are trying to achieve. A specific job? A promotion? A raise? More clients? More revenues? You have to put what you are selling into a larger context. Selling strategies always need to be in alignment with goals. As Ford Saeks, marketing Guru, said in a recent presentation: “For your success, Market, Message and Method all need to be aligned.” So you need to define “your market” – who are you selling to and for what purpose. The Second Step: Identify what you are “selling”: What is your expertise, your experiences, your skills, your character and your achievements/results? All together, these define the potential value you have to offer. This requires you also understand the needs of who you are selling to. Third, Build Your Leadership Stories: Rather than just list your credentials, be prepared to tell stories/give examples of how your expertise, experiences, etc. brought benefits to others. Fourth, Become a visible networker: Build internal and external relationships with people who can keep you informed, provide broader contacts, give career advice, etc. The goal is not to be out every day for lunch and networking events with no forethought about who needs to know you. Identify who are the Allies and Advocates who can help you. Allies are the people who will help coach you toward your career goals and Advocates will recommend you for jobs and projects. How will you sell yourself to them? Finally, one of the less appealing tendencies of women is how they handle compliments graciously. They have a tendency to brush off praise with a shrug and an “aw golly gee” reaction – and reply with some form of this comment: “It was nothing” or “It wasn’t really me, it was the team who accomplished this.” Women need to learn how to respond to compliments with a two-step approach: 1) Thank the person and 2) Focus on the benefit of the results to others. Now that I have your attention, let me clarify that what I mean is that women are notoriously guilty of not knowing how to toot their own horns and are not comfortable or skillful in the art of “self-promotion.” Over this last year I have been asked by several organizations to conduct presentations and workshops for their professional/executive women on this topic: The Courage to Sell Your Difference: Mastering the Art of Self-Promotion. My results should speak for themselves. B-r-a-g is a 4 letter word; nobody likes a blowhard grandstander and I don’t want to be seen that way. Others will “sing my praises” for me. Humility is a more politically correct or admirable character trait. I don’t want to be seen as aggressive. I don’t know what to say about myself that people want to hear about. If I talk about my accomplishments, it will make others look bad. One thing I know for sure is this: I can teach you how to “master the art of self-promotion” but unless you believe you need to acquire this competency, you will not practice it and become a master at using it. Period. Her question has been noodling in my head all week and inspired me to write this end of summer newsletter. Labor Day became an official holiday in 1894 and arose out of the interests of union leadership to recognize their members. I was not born into a union family, but somehow the message that it is a holiday to celebrate working people came through to me. 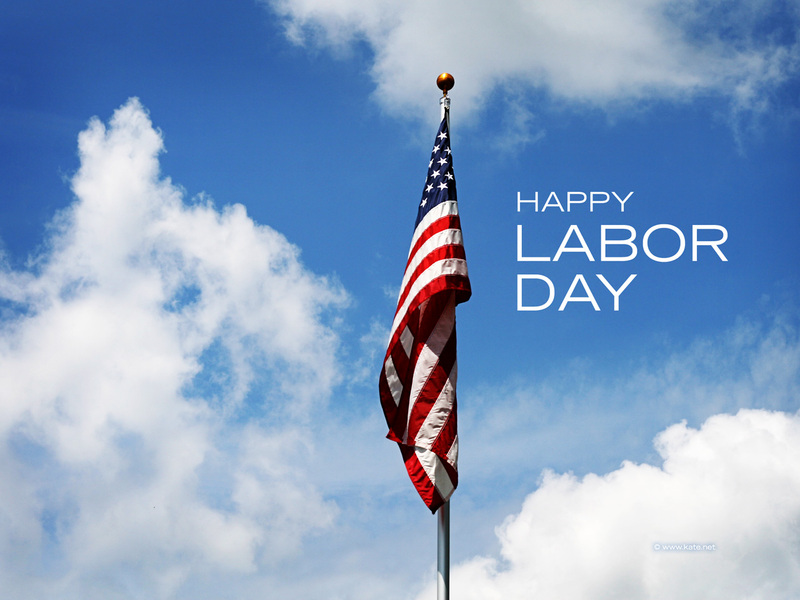 However, if we asked the average person on the street why we celebrate Labor Day, I would guess that many of them would say that it signifies the last day of summer and a time to have one more long week-end before school starts. And it is usually celebrated with pool parties and not patriotic parades. The official description of Labor Day is that it is a federal holiday which honors the economic and social contributions of working people. Just who are these people we should be celebrating? Well, obviously all of you who are reading this newsletter!! But as I was walking the streets of New York earlier this week, thinking about this newsletter, I came upon a woman that, perhaps, epitomizes a worker who may get overlooked. Walking down 5th Avenue my eyes first caught sight of what appeared to be a 4 year old girl sitting alone on a stool with a coloring book on her lap outside of a store. I was alarmed. Who was she? Why was she sitting there? Where was the adult who should be watching over her? I slowed down and looked around. And then I spotted a woman just ahead of me on the left handing out flyers encouraging pedestrians walking by to come into the store behind where the little girl was sitting. I put the two images together and developed a picture of a young child waiting and watching a woman, I assumed was her Mother, working. While it would be easy to judge the woman’s choice of a job or her child care strategy, this woman was doing work for pay that is likely well below minimum wage, but may be her only chance to earn money to buy food, clothing and more coloring books for her young child. And her daughter, sitting quietly and patiently, was also ‘working’ in support of her Mother. The working people that we should celebrate this Labor Day include this Mother, the executive who runs a multi-national company, and the high school student who works part-time at a bagel shop. They are the soldiers who fight for our freedom, the grocery store clerk who asks if she could help me find what I was looking for, and even the NFL players who are about to start their regular season. We are a nation that has as one of its core values the work ethic. A memory I have of my own Father is someone who worked three jobs in order to give his wife and three kids a solid middle-class life. And from his example we each learned that through smart and hard work we, too, could and have been successful. That message is as relevant today as it was almost fifty years ago. That is why we encourage our children to get a good education and to learn the discipline of practice through sports so they can develop the skills and character that will enable them to achieve their own version of the “American Dream”. Hard and smart work of our citizens built and will re-build this country. So this Labor Day I think we should hold to tradition and celebrate those who have the privilege to be working and contributing to our economy and their families’ and communities’ well-being. And we should keep in our prayers and offer support when we can to the over 23 million people today who want a job and cannot yet find one. And as I think about the meaning of Labor Day this week-end I will remember the woman and child I encountered in New York, working for each other. In a recent article in The New Yorker magazine (click here for article: “Personal Best”) a mid-career surgeon asks himself the question: “As an accomplished professional, do I need a coach?” To answer this question he first goes on a journey to understand the history and process of coaching, specifically in the United States. In his research, Atul Gawande, discovers that the use of coaches among talented professionals was more common than he could have ever imagined. He seems surprised to find out that a sports star like Rafael Nadal has his own tennis coach and that Itzhak Perlman, the famous violinist, used his wife, herself a concert violinist, as his ‘extra ear’ for years to help him fine-tune his style and tempo. As he proceeds to interview professionals in all types of careers, he comes to realize that coaches provide the outside eyes and ears for people who want to continue to take their performance to the next level. And although I have been a business coach for years, I, too, have used coaches at various points of time in my career. I have had coaches to help me learn how to write and deliver speeches; I’ve had coaches to help me target my marketing messages and map out my social media strategies; and I’ve even had coaches to help me sharpen the edges of my own coaching style. But not all coaches are created equal. I have had coaches that I thought were a waste of time and money and coaches who truly helped me take my ‘game’ to the next level. But in every instance I did get a different perspective and learned something new, either about myself or about the coaching subject. What is the question you want to answer? That is just another way of asking: “What is the issue you are trying to resolve?” or “What skills are you trying to learn or improve?” or “What is the result you are trying to achieve?” Sometimes you may even need a coach to help you get clear on that. In fact, the best coaches will ask and should help you to define that in your first session. Are you committed to taking actions and making changes? Whether you hire a coach to modify your golf swing or to help you learn how to ‘work a room’ or to become a more effective leader, the intent of coaching is change. So before you invest any time or money, you need to be honest with yourself about whether you really need to or want to make the changes necessary to help you get the new results you want. As Albert Einstein said: “The definition of insanity is doing the same thing over and over again and expecting different results.” So a good coach will be an accountability buddy who expects you to take responsibility for changes that lead you in the direction you want to go. Are you willing to measure your success? When I was in college and studying psychology I thought I wanted to be a clinical psychologist. But I was saved from a career of endless 45 minute therapy sessions by my Dad who suggested that I first get a job in business before deciding on graduate school. What a genius! After 5 years working for Ohio Bell Telephone Company, where I learned the importance of measuring everything, I got my graduate degree in organization psychology and went on to become a leadership and team coach. From the beginning of that career, I have emphasized with my clients the importance of setting objectives and of measuring the success of whatever we are working on. So it is with individual coaching, “What gets measured gets done”. You and your coach need to know what you are aiming for in order to know when you are making progress, when you are ‘off course’ and when you are ready to move off on your own. So if you answered ‘yes’ to these questions, the time may be right for you to seek the assistance of a coach. And then you will be faced with another important question: How do I pick the right coach for me? Each aspect of that question is crucial. It is probably obvious that if you want a coach to help you grow your business, you need to find someone with experience and references that he, in fact, has helped others grow their businesses. But you don’t necessarily need a coach who has owned and grown your specific type of business. Let me give a non-business example: Bela Karolyi, the famous Olympian gymnastics coach, has never been on a balance beam, but he has the expertise and experience that enables him to teach high performance techniques to young gymnasts and communicate and motivate them under demanding and stressful conditions. The ‘for me’ aspect of that question relates to the chemistry and trust that needs to develop between you and the coach. A few years ago a colleague introduced me to a “trust formula”, which I continue to reference. He said that trust is a function of credibility and empathy. And that the riskier the situation the more credibility and empathy you must demonstrate to the person with whom you are trying to develop trust. Here is an example of how that works with coaching. In this last year, I was hired by a woman lawyer who had considered two business development coaches before hiring me. She openly told me after our second session that she had not hired the other coach because he had been too aggressive in following up with her after their initial interview. Her thinking was “if this is the way he is trying to develop business with me, is this what he is going to tell me I have to do with prospective clients?” As a result of his behavior, she became wary of choosing him as her coach. He did not have credibility with her. This does not make him a ‘bad coach’, just a coach that did not mesh with her values. So where are you going to find this ‘right coach for you’? After deciding that he, in fact, wanted a coach, Gawande sought the assistance of a retired general surgeon with whom he had trained early in his career. They agreed that this new coach would first just attend a surgery, sitting at the back of the operating room. After the surgery he shared a long list of ‘small observations’ with Gawande, who seemed amazed at how, over the years, he had acquired habits that were not necessarily dangerous to his patients, but if altered, could avoid possible complications. Gawande had found someone to provide the external eyes and ears he needed. While it may be obvious that in your own search for a coach you shouldn’t spend time scanning the yellow pages or even searching the internet and picking the coach who has the highest SEO. But be equally as cautious about getting a referral from a colleague or a friend. Keep foremost in your mind the issue you need help with and the checklist of what type of experience and expertise is most important for you…what will give this person credibility with you. And then look for the empathy factor. Does this person seem to convey that the coaching experience is more about YOU then it is about the coach showing how smart she is? Does this person have a coaching process and style that seems a match to your learning style? Some in the coaching profession believe that the TRUE SECRET to good coaching is the ability to ask great questions that pull the right answers from their clients. When I hear these coaches proselytize about this Socratic coaching methodology I am always reminded of our daughter Carylyn giving me feedback on my coaching style with her when she was about 6 years old. For those of you who know Situational Leadership, the Telling Style is pretty appropriate in the early stages of parenting. However, being a self-proclaimed successful coach, I thought that it was time I started changing my parenting style with her. So for a short while whenever she would ask me a question I would respond in some fashion: “Well Carylyn that is a good question. What do you think?” And then I invariably would get this response from her: “Mommy, if I knew the answer I wouldn’t have asked you.”…Duh! So I went back to answering her questions. Empathizing with your client means knowing how to really listen and knowing how to ask the right questions. But it also means tentatively sharing your ‘hypothetical hunches’ that may lead to breakthrough insights, making specific behavioral and strategic suggestions and providing other resources like books, associations, networking to colleagues, etc. when appropriate. 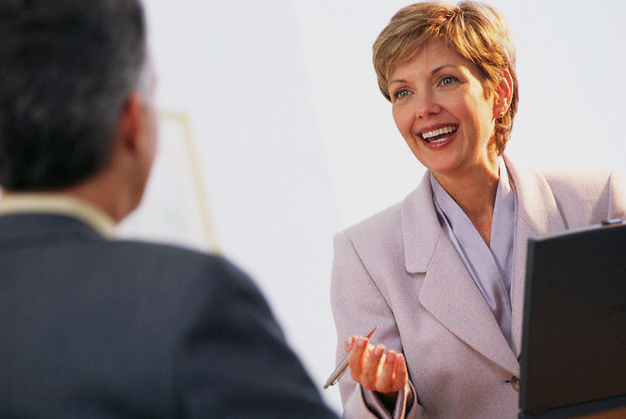 This newsletter has focused primarily on expertise-focused external coaching. However, there is a growing interest and trend in the field called peer coaching. 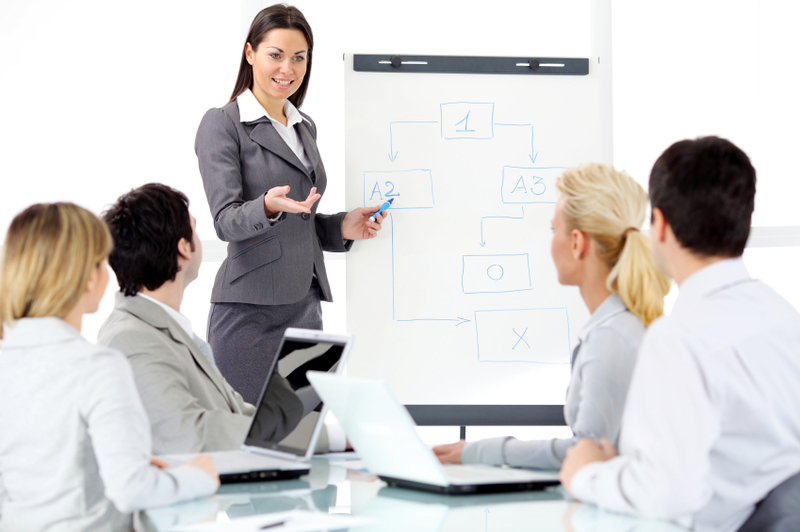 While it is a relatively new and not widely used process in the corporate business world, it has been used extensively as a tool for teacher development in the primary and secondary educational system in the U.S. and with CEO peer advisory groups, like the Women President’s Organization (WPO). Peer coaching differs from executive coaching or mentoring, for example, which assumes that someone more experienced has the wisdom to provide recommendations, offer counsel and give advice. Peer coaching, on the other hand, primarily relies on two or more people, who are colleagues, providing one another with both emotional support and a structured process for self-discovery. In peer coaching there is a healthy balance between ‘inquiry’, that is asking relevant and provocative questions, and ‘advocacy’, offering experiential-based insights (not advice) of what has worked in similar situations. “I got some great ideas from my peer coaches” and “We should do this regularly at our meetings”. Lynda McDermott is an international consultant, coach and keynote speaker who works with teams and individuals to achieve their strategic goals and results through improving their leadership, team or business development capabilities. She has worked in over 35 countries and is the author of three best-selling business books and numerous articles. She is a Certified Speaking Professional and has served on the adjunct faculty of INSEAD in Fountainbleu, France and the American Management Association. She is also a Chapter Chair of the Women President’s Organization. www.equiproint.com ; lmcdermott@equiproint.com and 212-421-1645/813-415-3664.